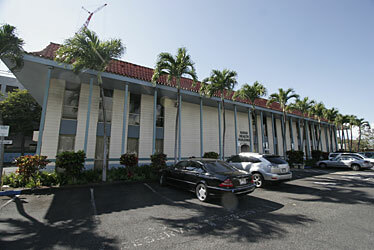 The Kukui Children's Foundation building on North Kukui Street is being renovated. The Harry and Jeanette Weinberg Foundation has donated $800,000 to renovate a building on the edge of Chinatown that will house a unique center to help families and abused children. Occupying the building at 245 N. Kukui St. will be: Family Promise of Hawaii, the Learning Disabilities Association of Hawaii, the Consuelo Foundation, Na Loio and Kids Hurt Too. "There is nothing like it in the state," said Judy Lind, executive director of the Kukui Children's Foundation, recipient of the Weinberg grant. The programs will work as partners to "serve each other's clients and provide services to the same families," she said. Lind retired in June 2005 from the Judiciary, where she founded and directed the statewide Children's Justice Centers (formerly Children's Advocacy Centers). She and others who had been involved in organizations providing services to abused children formed the Kukui Children's Foundation "to serve vulnerable children and those who have been harmed." The foundation purchased the two-story building next to Kukui Gardens in 2005 with a $3.5 million community development block grant from the U.S. Department of Housing and Urban Development through the City and County of Honolulu. Other donors to the project include: HUD, $445,500; Mary D. and Walter F. Fear Eleemosynary Trust, $250,000; Atherton Family Foundation, $150,000; McInerny Foundation, $50,000; Bank of Hawaii, $25,000; Office of Hawaiian Affairs, $25,000. Building renovations and tenant improvements are estimated at $2.5 million. About 75 percent has been raised, Lind said. "The tenants also are trying to raise money. To the extent that we're successful in getting money, we will help them." She said the project, expected to be operational by July, has received support from all levels of government, donors of materials and equipment and artists who will decorate public areas. Speaking at a recent luncheon for the Weinberg Foundation grant presentation, Jack Dwyer of the Kukui Children's Foundation said the gift will enable major renovations to the building, including a new roof, new air-conditioning system and an elevator to meet federal requirements. The five agencies in the Harry and Jeanette Weinberg Foundation Kukui Center "will share their knowledge and visions to help abused children," Dwyer said. "Having a place where they are all located makes it very visible and accessible to people. We are excited about where we are going to go, with vital services. Kids need our protection." The Kukui Children's Foundation , in a statement of need , pointed to a "phenomenal growth in two of the most serious social problems children face in our community: Child abuse and homelessness." Homeless children suffer psychological harm, Lind said. » Kids Hurt Too and the Hawaii Foster Youth Network expect to serve about 300 youngsters ages 3 to 19 annually, creating centers for young children and teens and a leadership program for older foster youths. » Family Promise Hawaii, a network of churches that rotate as hosts for homeless families, will serve 50 or more homeless families with children annually . » The Consuelo Foundation will develop a playground at the center and is talking to the other tenants to see where it can fill in services. It's considering enrichment programs for abused children, respite care and a family resource center. » The Learning Disabilities Association of Hawaii advocates for parents, helping them get services for children with special needs. It works with about 30 new children annually and says other children need to be identified for services. » Na Loio Immigrant Rights and Public Interest Legal Center provides free legal services for low-income residents, especially immigrants who are victims of domestic violence, sexual assault, child abuse and other immigration law violations. Anyone wishing to help or donate to the new Kukui Children's Center may call 373-1224 or e-mail: kukuichildrensfoun@hawaii.rr.com.